Flying of kites has been a common thing all over Thailand especially between November and April of every year. The competitions are typically regional. Majority of these kite flying competitions, you can also have the chance of watching live dance performances as well as beauty competitions. Aside from that, but you can also listen to live folk music while also trying the local delicacies and also purchase local handicrafts. If you chose to experience real local Thai celebration during your tour of Thailand, you can't afford to miss attending the kite competition. At Chula and Pakpao kite competitions, the Chula kite (on the right) is considered to be the King of single-line kites, while the Pakpao kite is the Queen. You can watch kite flying during the Thai winter, close to the end of the year, and in the summer around March and April. This is because of the two monsoon winds that affect Thailand every year: the north-eastern monsoon winds and the south-western monsoon winds. Fancy Kite Show: The 2018 event will showcase 20 kite flying teams from many different nationalities, like Germany, Switzerland, and France. Among the displays of beautiful kites from all over the world will include gigantic kites in superheroes shapes and cartoon characters as well as in geometric forms. Also, there are spectacular musical performance of revolution kites and a show of stunt kites with fliers who'll contend to show off their high-speed flying abilities. This is a show of exceptional Thai kites which will be dancing in the sky, escorted by Thai classical music Pi Phat ensemble. An event to design a ground adorned with wind-playing arts including kites and other materials which is movable by wind, sound producing pieces like turbines, mobiles, bells, etc., and see the professional wind garden beautification. Try a hand at making, drawing and painting a kite at the Kite Kid Paint corner, create a limited edition of art pieces at the Do-It-Yourself (DIY) division, or learn how to make a boomerang and how to throw it at the Boomerang Workshop. This is a convoy of movable food shops that provide signature menus of Hua Hin. There are also utility objects, ornaments, and local handiworks for sales, as well as shops from the communities in Prachuap Khiri Khan. Also, enjoy light music and a relaxing atmosphere of Hua Hin. The exhibit applies to collaborate multimedia technology in telling the story of Thai kites entertainingly. An event that offers an open area for kite flying families to enjoy themselves together. Check and buy kites at many colourful kite stalls. The Chula kite and Pakpao kite are the most famous Thai kites flown nationwide. Aside from the kites, the north-east people and their counterparts in the south build exceptional kites to fly during harvesting season. While the Aeg kite is synonymous with the north-east, the south is renowned for the Buffalo kite and the Crescent Moon kite. Modern Aeg kites are entering the yearly Buriram's Isan Kite Festival in northeastern Thailand. This fun-filled event is held in December at the Provincial Stadium, Amphoe Huai Rat in Buriram. Other popular kites around Thailand include E-Loum kite, Dui Dui kite, and animal kites like snake kite, butterfly kite, bird kite, stingray kite and so on. The Pakpao (1), the E-Lum (2), the E-Lum Hua Taek (3), the E-phraet (4) and the Dui Dui (5) are traditional Thai kites, just like the Chula kite. The Chula and the Pakpao are the most famous traditional kites in Thailand. The Thais have been known to be fighters since the reign of Sukhothai. An excellent example of that is Muay Thai fighting. Thai kite competitions feature a fighting element between two kites: the male Chula kite and the female Pakpao kite. These are plain white kites that perform exciting manoeuvres in the sky. The Pakpao kite or Wow Pakpao is almost half the size of the Chulakite. The female kite comes in diamond shapes with a long tail, that is used in dragging down the male Chula kite. A Pakpao kite team is made up of 4 to 5 members. Every year, you can watch major Chula and Pakpao kite competitions in Ratchaburi (April), Samut Songkhram (March), Sukhothai (December) and Satun (February). Please check with the local tourist office for up-to-date information. The Chula kite or Wow Chula is in the shape of a star. This male kite is about 5-7 feet long. Its weapon is the bamboo barbs, attached to its flying line, used to snag the Pakpao kite back into Chula's territory. A standard team to fly the Chula kite consists of 20 people. Other than the traditional Thai kites mentioned above, animal kites are also popular. Foreign kites influenced them. Among all the animal kites, the snake kite is the preferred toy among young kiters since it's easy to fly and looks alive. Other animal kites include butterfly kite, peacock kite, bird kite, fish kite, swallow kite and stingray kite. Foreign kites influenced animal kites in Thailand. The most common ones are the snake kite or Wow Ngu(6), the peacock kite or Wow NokYoong(7), the swallow kite or Wow Nok Peek Aen(8) and the fish kite or Wow Plaa(9). The bird kites are widely flown in the south of Thailand. The 2018 edition of Thailand International Kite Festival took place between 23 and 25 March in Hua Hin. Thailand Tourism Authority had previously invited 20 kite flying teams from various countries across the world like Switzerland, France, Germany, and China. 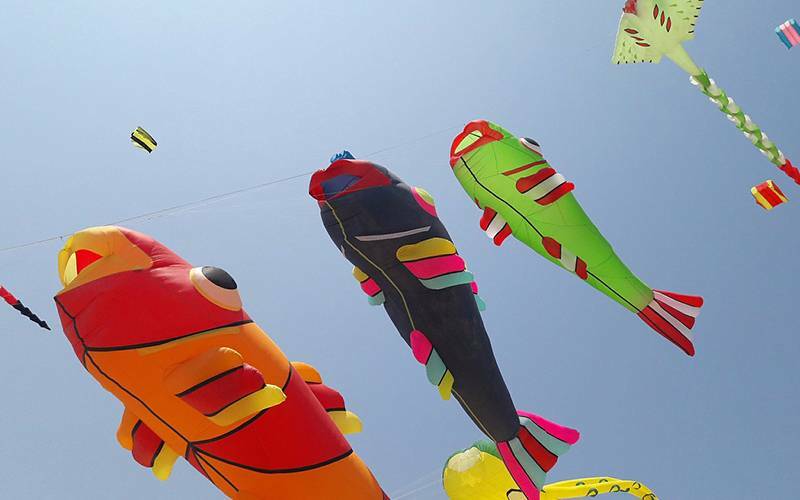 The event attracted thousands of kite supporters worldwide to the renowned seaside destination on the Gulf of Thailand. Also, there are the stunning musical performance of revolution kites and a show of stunt kites with fliers who'll compete to show off their high-speed flying skills.